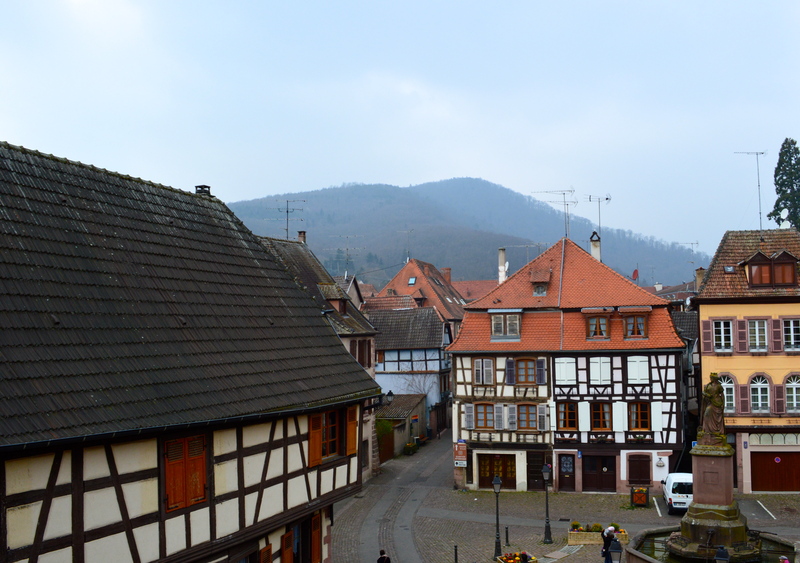 Last weekend, S and I stepped into a post card in the French town of Ribeavillé, just a quick 2.5 hour drive from Mainz through the gorgeous French countryside. The views along the way and the town itself made every minute in the car well worth it. Stepping into Ribeauvillé is like stepping back in time into a sleepy French village of small half-timbered buildings where the only things to do are enjoy delicious French meals, sip the local wine varietals, smell the fresh air, and hike the Vosges to breathtaking views and century-old castles. This town is pure relaxation as it makes you forget that things like office buildings, bank accounts, and traffic jams exist. At the Wymann and Jean Sipp tasting rooms, we tried several Rieslings and Gewürztraminers — some dry, some sweet, and some really sweet. We also found some amazing Pinot Noir at the little shop for Domaine du Moulin de Dusenbach.